The new Driftless Area 2.0 hat from RepYourWaters will help support conservation work in the Drifless Area. One percent of sales from the hat will go to Beyond the Pond, a 501c3 non-profit organization for the National Fish Habitat Partnership. 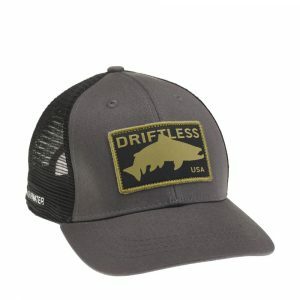 RepYourWater, a Colorado-based angling and hunting gear company, founded by the husband and wife team of Garrison and Corinne Doctor, has a new Driftless Area 2.0 hat for sale with 1% of sales going to Beyond the Pond, 501c3 non-profit organization for the National Fish Habitat Partnership. Sales of the hat, will benefit conservation work through theDriftless Area Restoration Effort (DARE), a National Fish Habitat Partnership partner. RepYourWater is a leader in providing creative and unique designs on high-quality apparel and merchandise as well as making a difference for wildlife habitat around the country. In addition to benefitting from 1% of sales of the Driftless 2.0 hat, Beyond the Pond will also receive 1% of all hat sales from Wisconsin, Iowa, and Illinois state hats, as they make up the Driftless Area. RepYourWater state hats can be found here. Along with Beyond the Pond, RepYourWater donates 1% of sales of corresponding designs to the Trout Unlimited chapters of Canada, Wyoming, Colorado, Pennsylvania, Southeastern Conservation Project, New Mexico, and Connecticut, Backcountry Hunters and Anglers Chapters in Utah, Alaska and Montana, the Wild Steelhead Coalition, New Mexico Wildlife Federation, Delta Waterfowl Idaho Wildlife Federation, Boundary Waters Trust, the Billfish Foundation, and the Bonefish and Tarpon Trust. RepYourWater also donates 10% of sales from its conservation collection to their conservation partners, which Beyond the Pond is fortunate to be included in. Additional details on the conservation collection can be found here.